Year by year Poland is attracting a growing number of tourists. We know from our experience that most of them have a good impression about our country. They emphasize that were enchanted by its diversity, hospitable inhabitants and the greatness of monuments from various historical periods. However, a large number of tourist attractions makes almost impossible to visit all historical cities or to see every beautiful landscape during one stay. What is “a must” to see if you have limited time for a trip to Poland? 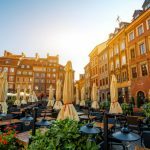 What are the most visited places in Poland? 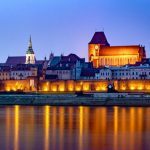 Take a look at the list of TOP 10 of the most interesting places in Poland. Without a doubt the most popular place to visit, Krakow is Poland’s ancient capital and one of 15 UNESCO prime World Heritage sites in the country. Krakow has a perfectly preserved Old Town, a royal castle and several fascinating areas. The historical districts are big enough such that you won’t be bored and yet nothing is so far apart that you couldn’t comfortably reach on foot. On top, there is a great number of superb travel destinations in the vicinity. The capital of Poland is an exciting city of contrasts with a poignant history to tell. Severely demolished (destroyed up to 85%) in World War II: to see the contrasts visit the Old Town and the remains of the Jewish ghetto area. Postwar reconstruction implanted socialist realist architecture and drab housing blocks, while post-communism development brought glossy and award-winning modern buildings. The flock of 26 downtown skyscrapers is still guarded by a stern present from Stalin: the Palace of Culture. Possibly the most famous salt mine and oldest functioning business enterprise in the world. Salt has been mined here since the 13th century and probably even earlier. Today there are 300 km of surviving corridors spread over 9 floors as deep as 327 m underground. 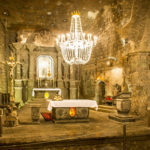 Your visit to this subterranean kingdom of salt (12 km from Krakow) will be unforgettable. Auschwitz-Birkenau is synonymous with terror, cruelty and the Shoah – the annihilation of European Jews. This is the largest of the former Nazi German concentration and extermination camps. The surviving barracks now house a very graphic museum of the Holocaust recounting the terror inflicted on various nationalities jailed and gassed on the location. Approximately 1.3 million human beings died here between 1940-1945. Located in the town of Oswiecim, 60 km west of Krakow. 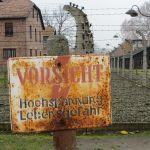 Please do not call the Oswiecim town by the German name of Auschwitz as the local residents consider it very offensive. Once a rich Hanseatic port city, today its extensive and charming historical areas pull in local and foreign visitors. 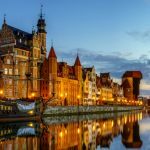 Gdańsk is the birthplace of the Solidarity Movement, the place where WW2 started and the nation’s leading summer holiday resort by the Baltic coast. 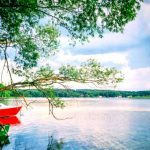 Masuria with its three thousand lakes is one of the most amazing areas in Poland. Mikołajki stands out from all other beautiful Masurian resorts as the liveliest place. Besides having modern amenities, it is also ideally situated in the middle of the Masurian boat trip routes. One of the smallest Polish national parks (almost 3 sq km), but mountain lovers often say that Pieniny is the loveliest mountains in Poland. In any case these mountains are ideal if you do not have special trekking equipment (needed in the Tatra) and do not want to wander too far from civilization (which can happen in the Bieszczady). 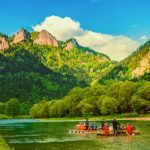 There are several fabulous hikes, cultural landmarks, and the famous Dunajec River Gorge rafting trip: one of the best attractions in Poland. The bases for exploring the Pieniny are the spectacular spa town of Szczawnica (wooden architecture) and lively Krościenko. The southern part of the Pieniny is located in Slovakia. The Tatras are the highest, most dramatic and varied mountain range in Poland, alpine in style, with the highest Polish mountain, Rysy, at 2499 m. Only 22% of the mountains are within the Polish border; the larger and higher southern part is in Slovakia (Gerlach 2655 m). The Tatras are perfect for hikers – in the Polish part there are over 70 hiking routes, each taking 1-4 hrs. 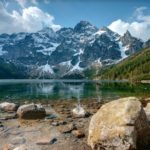 The town of Zakopane is the most popular base camp, though you should also try Chochołów or Witów in the west; or Białka Tatrzańska, Murzasichle or Bukowina Tatrzańska in the east, especially during peak periods when Zakopane can get very crowded. Behind the metropolitan atmosphere of the capital of Silesia lies a tumultuous history. 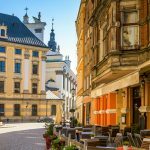 The large old town with fabulous square and numerous islands connected by 112 bridges help explain why it is considered as one of the most interesting places in Poland. The birthplace of Nicolaus Copernicus and a pearl of Gothic architecture (mostly original buildings since the city was largely undamaged by wars), Toruń is a picturesque and large historical UNESCO heritage city. Sounds appealing? And it’s just a beginning. Don’t miss your chance to make your own list of the most interesting Polish sites. Book your flight tickets, we will take care of the rest of the arrangements. Join one of our guaranteed departure tours to discover the best of Poland. Click below for more details!